IELTS Listening Section 4 is arguably the most difficult part of the listening test. A single speaker delivers a talk or a lecture, and all ten questions have to be answered without a break. Listen to a talk on robots as carers for the elderly and answer the questions. Fill in the gaps with one word or a number! Why do we need robots to care for the elderly? (1) systems cannot cope with the increasing numbers of old people. Nadine has been under development for (3) years. Mera is being developed by IBM. ..watch a video of a patient’s (7) to monitor their heart and breathing. ..detect physical changes in patients. Paro, a robotic (11) , was developed in Japan. Paro knows when a patient (12) it, and is designed to look patients in the eye. In clinical trials, Paro helped to control symptoms including depression, anxiety and stress. Paro can also be (13) to treat other psychological symptoms. 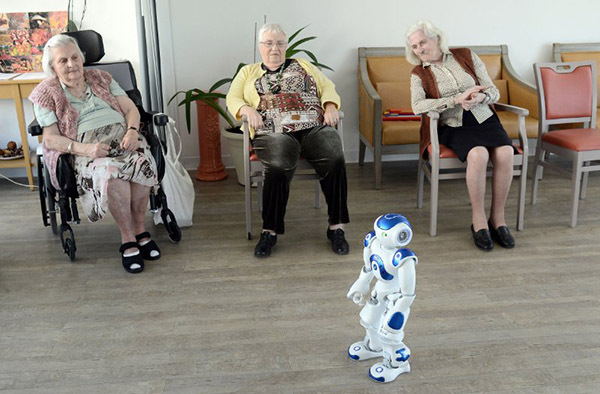 Elderly people may become even more (14) if human carers are replaced by robots. Robots need to be programmed with personal information.